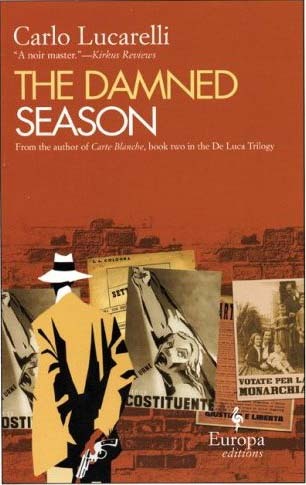 THE DAMNED SEASON is the middle part of the De Luca trilogy, following on from CARTE BLANCHE. At the end of CARTE BLANCHE, Commisario De Luca is fleeing from the new authorities, as, even though he considers himself to be a policeman first and foremost, he had been in effect working for the enemy. On the run, he is spotted by a village policeman who recognises him. But instead of handing De Luca over, he blackmails De Luca into helping him solve a triple murder case so as to improve his own promotion prospects. So De Luca becomes 'an engineer' to any one that's interested and helps the policeman read the crime scene, a farm, and interview the local resistance group members who mete out their own justice. De Luca has no choice to play out the hand that's been dealt to him and comes close to losing his life before he does in fact lose his freedom. This trilogy is a fascinating look at Italy just after World War Two and the confusion and chaos within. De Luca is a sympathetic character who appears to try and do the right thing, irrespective of the politicians above him. There is a also a diverting murder mystery enclosed within this slight book and that story is slightly less confusing than the one in CARTE BLANCHE where there were many different police departments and a slice of politics involved. I can't wait to see how events pan out for De Luca in the final part, VIA DELLE OCHE, and I just hope he survives!